As it's often said, one of the best ways to get to know a place is through its food, and there's nowhere better to follow that mantra than Paris, where culinary experiences allow you to be part of the local culture. Here are a few ways to do so. Typically limited to 15 people, a small-group cooking class provides personalized attention from a chef or instructor during a hands-on lesson where you might make classic French dishes such as soufflé or coq au vin. Most classes also offer insight into French culinary traditions, such as the proper ordering of courses and the importance of cheese. Wine is often included. No meal starts without ingredients, so if you're looking for a well-rounded food experience in Paris, book a cooking class that starts with a trip to a local market with a chef or guide to shop for fresh produce, herbs, and meat. You'll see how locals search for the perfect items and might have the chance to chat with vendors yourself. Most cooking classes end with eating your creations, but how much you make and eat depends on the class. For a full French meal, book a lesson that includes multiple courses so you can learn how to make a variety of dishes and enjoy lunch or dinner in a more formal setting. Paris is a sugar high, with the array of decadent desserts and other sweet treats on offer at patisseries, boulangeries, and chocolateries all over town. So it's no wonder that many culinary classes focus on how make pastries, from classic baguettes to colorful macarons. You can't go wrong with a croissant lesson, one of the most popular, but for something fancier, you might learn how to make éclairs, tarts, or even crème brûlée. Discover the cultural highlights and delectable bites of France’s capital on a 3-hour culinary tour of Paris. Spend the afternoon strolling past the city’s iconic monuments with a guide and enjoy intermittent samples of pastries, chocolate and freshly baked bread. Listen to commentary of Paris’ rich heritage and receive personalized attention from your guide on this small-group tour, limited to only eight people. Add some extra sparkle to your Paris trip with a Champagne-tasting cruise down the River Seine. With an English-speaking sommelier, enjoy an educational Champagne presentation in the comfort of a private room. Sip on three fine Champagnes as you float past Paris’ signature monuments such as the Eiffel Tower, the Louvre, and Musée d’Orsay. Get the authentic French culinary experience with a small-group cooking class in a private Parisian apartment. Head to the centrally-located home and get ready to learn — and eat! Meet your local chef instructor, gather ingredients on an optional market tour, and discover the fundamentals of preparing classic French dishes such as soufflé, cod mouclade, and chocolate fondant. Then prepare and savor delicious dishes with fellow food lovers. Sample fine French wine during a tasting session in a chic, Parisian wine bar. Learn about the top winemaking regions in France from your sommelier, as well as the subtle nuances in each varietal. Select from three sessions, varying from Champagne, cheese, and charcuterie tastings, and opt to purchase your favorite bottle to bring home. Add some variety to your Paris itinerary and learn to make French macarons from a local chef. Take a cooking class in a private apartment in central Paris, where your chef will guide you through the process of making one of the country's most delightful sweets. Watch how to make the perfect meringues and hear the secrets behind the flavorful layers of cream. Class size is limited to eight people, ensuring more personalized attention. Learn the secrets to making traditional French baguettes and croissants during a 2-hour baking workshop with a chef. Get time-tested recipes handed down over generations, and bread-making techniques that will help you make perfect baked goods. This is a hands-on baking lesson in the back rooms of a French bakery in Paris with group size limited to eight people for maximum personal attention from the instructor for each student. Leave the class with your own freshly-baked baguette to snack on later. Discover the fascinating history and flavors of the vibrant Bastille district of Paris. Follow your local foodie guide to the area’s best-kept gourmet secrets, including patisseries, delicatessens and wine bars. Explore the specialty food stalls of the Marché d’Aligre market to see how local Parisians shop, and enjoy six tastings of sweet and savory favorites along with samplings of French wine. Numbers are limited to eight people on this small-group tour for a personalized experience. If Parisian patisseries have you feeling inspired, test out your own baking skills with this 3-hour cooking class in Paris! Learn to make two or three classic desserts in the home kitchen of a local chef. Get professional tips and tricks for mastering recipes of beloved French and international desserts, and enjoy the fruits of your labor while chatting with your host. Class size is limited to eight people to ensure a personalized, hands-on cooking experience. Treat your taste buds to a chocolate walking tour of some of Paris’s finest sweet boutiques! Sample delectable truffles, clusters, cookies and bars at five top-rated chocolate shops within the city’s elegant 1st arrondissement. Learn about the time-honored French art of making chocolate and pass some of the city’s most famous sights along the way. Numbers are limited to eight people for a personalized tasting experience. Sample the culinary delights of Paris on a walking tour through one of the city’s charming historic neighborhoods. Follow your taste buds and your guide to a handful of Parisian cafés, patisseries and specialty stores to sample authentic French favorites like foie gras, artisan cheese and fresh-baked bread, while your guide shares with you the history of the neighborhood. You’ll discuss the tastings that you enjoy and how they are used in gourmet French cooking, and top it all off with a glass of excellent French wine. Numbers are limited to eight people for a personalized small-group experience. Butter, water, flour and eggs — learn how to take these simple ingredients and produce a French pastry masterpiece. Set in a professional kitchen in the heart of Paris, this hands-on experience guides you step-by-step into making desserts like choux or puff pastries, macarons, croissants or an iconic French dessert like crème brulee. Enjoy the process with a professional English-speaking chef during a 2.5- or 3-hour morning or afternoon class. Best of all, you get to devour your creations! Spend some quality time in the kitchens of a French bakery to learn the inside secrets of French baking during a boulangerie tour. Join an expert French baker in the back rooms of a well-known bakery in central Paris to hear some of the secrets that make French pastries and breads so special and learn how to make a perfect French baguette. 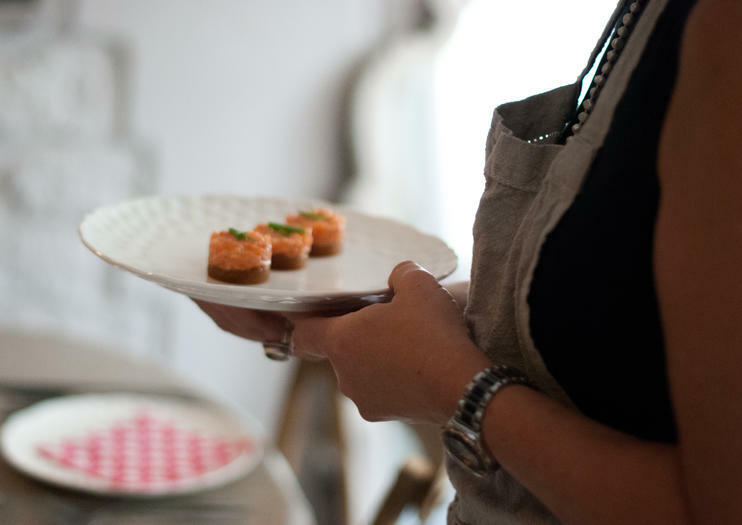 Discover the art of fine French cuisine with a small-group cooking class and gourmet meal in Paris. Learn about the traditions and flavors that have made French food famous the world over, and help prepare an authentic, 4-course meal under the guidance of a local chef. When the cooking’s done, join your new friends around a cozy table to enjoy the delicious home-cooked meal paired with a selection of French wine. Opt for a longer, 6-hour experience to start the evening with a shopping trip at a local market. Explore gourmet shops and bustling food markets in Paris on this 3-hour walking tour of the Bastille district. Follow your guide from the Place de la Bastille to the Port de l’Arsenal, where the Canal St-Martin joins the Seine River. Stroll beneath the trees along the Promenade Plantée and admire the Viaduc des Arts. Visit Alain Ducasse’s famous chocolate shop, wander through traditional food markets and learn of the French Revolution in 18th-century Paris. Your tour size is limited to eight people to ensure a more personalized experience. Discover the story and secrets of chocolate with an entrance ticket to Choco-Story, the Gourmet Chocolate Museum in Paris. A treasure trove of all things chocolate, this fascinating museum charts the history of this delectable treat, from its use in the mystic rituals of the Olmecs, Aztec and Mayan civilisations to the indulgent treats displayed in Paris’ luxury chocolatier shops. Treat your tastebuds to different chocolate offerings from the world, watch chocolate-making demonstrations, and upgrade to finish your visit with a delectable cup of rich, frothy hot chocolate. Learn to shop and eat like a real Parisian on a small-group walking tour of the Marché d’Aligre. Located in the less touristy 12th arrondissement, this energetic market is a favorite with locals and is bursting with vendor stalls selling all manner of goods and gourmet treats. Follow your guide to the best shops to chat with vendors and taste with choice chocolates, cheeses and wine. Group size is limited to eight people for a more personalized experience. Slip into the cellar-like tasting room of an acclaimed Paris wine bar-restaurant for an elegant 2.5-hour wine tasting dinner. An experienced sommelier has chosen four stellar French wines, including Champagne, each selected to pair perfectly with the three courses of your meal prepared by a Cordon Bleu chef. Gain insight into the origins of each wine and soak up the convivial atmosphere. Finish your delightful evening with a delicious digestif. Indulge in an evening of fine dining in Paris with a 3-course meal accompanied by French wine. Enjoy three courses of haute cuisine in a chic restaurant not far from the Louvre Museum, where a talented young chef is at the helm and where each course is matched perfectly with a glass of French wine. Begin with a Champagne aperitif and finish with a digestif to complete the perfect French dinner experience. Spend a memorable and authentic evening in Paris with dinner at the home of a local family. Join your Parisian hosts at their private apartment and savor a four-course meal of French cuisine prepared by a gourmet caterer or restaurant. Get a glimpse into daily Parisian life and enjoy lively conversation in English with your new friends. Create a sumptuous Christmas dinner using France’s rich culinary heritage during this winter-time cooking lesson in Paris. Learn the tricks of the trade from a professional chef, whose experience includes working at a Michelin-starred restaurant. Using seasonal ingredients from a nearby Parisian market, cook with a pro and produce a traditional French meal, which culminates with a Bûche de Noël cake. When Christmas rolls around, you’re sure to impress family and friends back home with your new culinary prowess. Bon appétit! Taste your way through Paris’ vibrant Bastille and St-Germain-des-Prés districts on this full-day gourmet walking tour. Eat like a true Parisian as you explore the vendor stalls of the Aligre Market, indulge your sweet tooth at the city’s best chocolatiers and sip French wines with a sommelier-led tasting. Rest your feet during lunch at a typical Parisian café and refresh with an afternoon tea-and-pastry break. Group size is limited to 8 for a personalized small-group experience. The tour includes lunch and all tastings.